Republic Broadcasting Network » Don’t assume the militias at the Charlottesville rally were white supremacists. This is what they believe now. A few weeks ago, the Charlottesville “Unite the Right” demonstrations – where violence wounded at least 34 people and killed one counterprotester — drew a tremendous amount of national attention. Much of the discussion focused on two opposing groups: the white supremacists who call themselves the alt-right and the counter-demonstrators who came to oppose racism. But a third group was there as well: militia members, wearing camouflage, carrying long guns and claiming to be there to keep the peace and protect free speech. Who are those armed militia members and what do they stand for? Some observers have lumped these militias in with white supremacists. While these armed men shouldn’t be absolved of their role as de facto security for the rest of those in Charlottesville that weekend, they are not neo-Nazis or white supremacists. Here’s a quick version of what scholars know about the complicated history of how racial identity has influenced this movement. The militia movement contains a wide range of actors motivated by different things, but they share one fundamental characteristic: they are prepared to use firearms to protect rights they see as threatened by the government and to restore what they see as the Founders’ perfect plan for America. The contemporary militia movement has roots in racist and anti-Semitic groups in the 1970s and 1980s, especially the Posse Comitatus, a group that combined the virulent racism of Christian Identity (which depicts Jews as the literal descendants of Satan and people of color as “mudpeople” who aren’t fully human) with conspiratorial beliefs about the federal government as a threat to all Americans. During the farming crisis in the late 1970s, this group worked to convince struggling farmers that a Jewish conspiracy was behind their economic problems. Posse Comitatus peaked in 1983, when a supporter named Gordon Kahl died in a shootout with the FBI and local law enforcement in North Dakota. Although never large, Posse Comitatus developed some anti-government ideas that are now common in the militia movement. By the 1990s, attitudes toward race divided the movement. Disastrous interactions between Americans and law enforcement at Ruby Ridge and the Branch Davidian compound in Waco, Tex., helped various militias recruit and become more active, but groups interpreted these interactions differently. For instance, the Militia of Montana argued that these events revealed the existence of the dangers posed by the New World Order, a conspiracy theory that often features an international cabal of Jewish financial elites. The Michigan Militia – one of the most prominent 1990s militia groups, whose leader, Norm Olson, testified before the Senate in homemade fatigues — rejected the racism and anti-Semitism aspects of such conspiracy theories, instead arguing that the federal government violates individual rights regardless of race or religion. The violent culmination of this thinking came April 19, 1995, when Timothy McVeigh bombed the Alfred P. Murrah Federal Building in Oklahoma City. McVeigh claimed that he did so as revenge for Ruby Ridge and Waco, and journalists noted his ties to the militia movement. At the same time, McVeigh was obsessed with “The Turner Diaries,” a racist, apocalyptic book that depicted white Americans fighting and defeating a government dominated by Jews and blacks. The Oklahoma City bombing may have been a culmination — but it was also a turning point. Afterward, militias and their anti-government rhetoric became anathema to many. Membership dropped, and many groups dissolved. Since 2009, the militia movement has been surging again. Though an imperfect measure, the Southern Poverty Law Center documented an increase in the number of militia groups from about 150 in the 2000-2008 period, to more than 500 in 2009 and more than 1,300 in 2012. Many leaders in this new wave have publicly rejected white supremacy and have vehemently condemned McVeigh — although they reserve the right to use violence against the government in the future. For instance, the Oath Keepers, a prominent group that primarily tries to appeal to those with military or law enforcement experience, makes a point of publicizing its members of color. Stewart Rhodes, the group’s founder and president, has toldjournalists that he is “a quarter Mexican, so it’s kind of hard for me to be a white supremacist.” He has said that his group doesn’t tolerate anti-Semitism. For example, the group proudly points out that it defended minority-owned businesses in Ferguson, Mo., during the protests after Michael Brown’s death, further demonstrating that they aren’t racist. Of course, some militia members are racist and bigoted. But as sociologist Amy Cooter found in her research on Michigan militias, “the prevalence of individual racism does not exceed what would likely be found in other gatherings of the same demographic.” Most militia adherents aren’t motivated by a sense of racial superiority, although racial stereotypes can and do influence their views. And while the militia movement has largely rejected its once–prevalent anti-Semitism, virulent Islamophobia has replaced it. Militias often list Islam (or “radical Islam”) as one of the three biggest threats America faces, along with “collectivism” and “illegal immigration,” any of which could lead to tyranny. 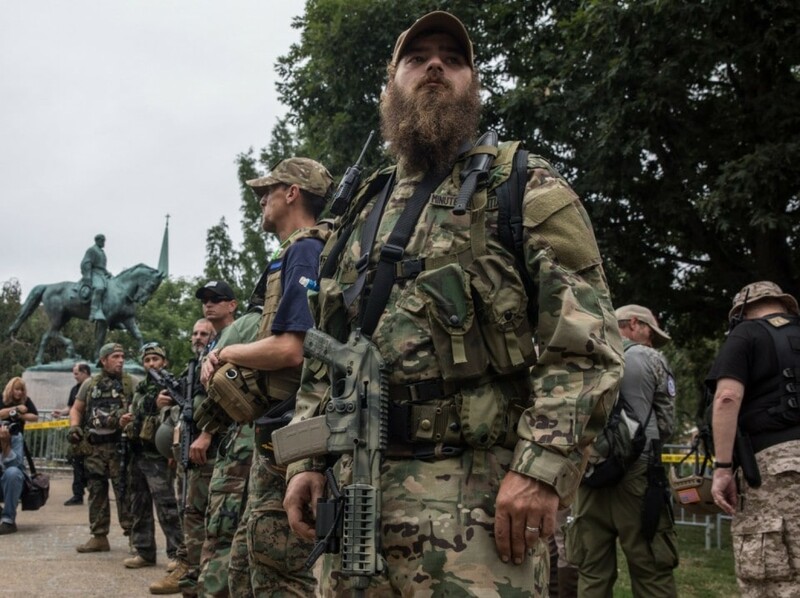 The militias that showed up in Charlottesville are prepared to use their firearms to defend America, which they believe to be under attack. For the most part, they want to protect political ideals, not (imagined) genetics. Calling them neo-Nazis contributes to their perception that they — and by extension, America itself — are under attack by enemies who must be defeated, with violence if necessary. Sam Jackson is a PhD candidate at Syracuse University researching the militia movement. Follow him on Twitter @sjacks26.